As mentioned in our TT02 Review (Here) the TT02 is a superb replacement for the TT01. One of the main improvements was the prop shaft being much more efficient, even when running brushless motors. This made the upgrade to a Aluminium prop shaft less important for those wanting to get some speed into the car. However, in a series of updates on how to make the TT02 more competitive at the track I thought it would be good to look at these option parts to see if they are worth upgrading. What are the benefits of this upgrade? The aluminium prop shaft and joint offer more stiffness that the plastic parts they are replacing. As already mentioned the stock parts are very usable, however these being stiffer will ensure even more efficient power delivery. 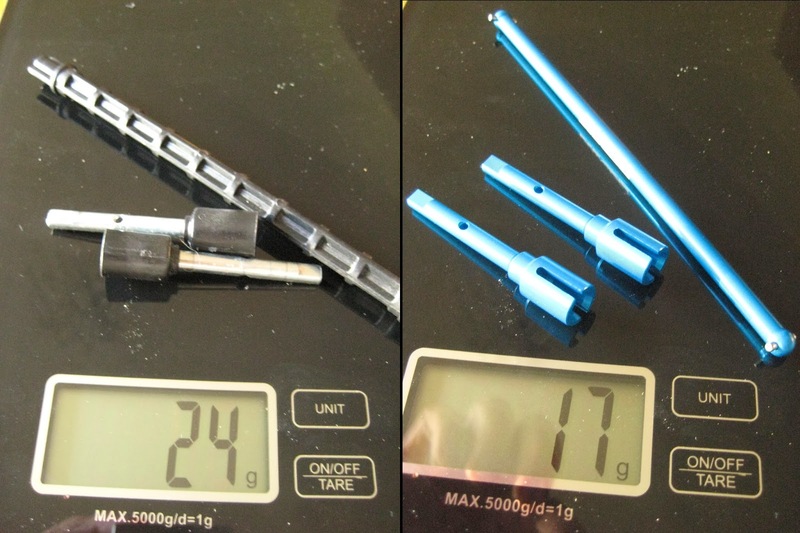 As can be seen in the picture above, the new parts are 7g lighter than the stock parts. This is a big deal as the prop shaft is what drives the car and this will ensure less rotating mass, giving the car quicker acceleration and providing more throttle response as the motor has less weight to push along the drive train. It's blue! Tamiya Blue! and it even has the logo on it..
Its all very easy to fit as you would expect with a Tamiya. I just unscrewed the 4 screws on the front and rear bulkhead and then lifted it up so I could remove the prop joints, it took less than 5 minutes to do this. And here is the front already fitted. I have removed the steering for a clearer picture, you will not need to do this. The one thing I found is that the prop shaft does have some lateral movement in the prop joints. This doesnt really affect the efficiency, however I do not like the idea of it moving that much. 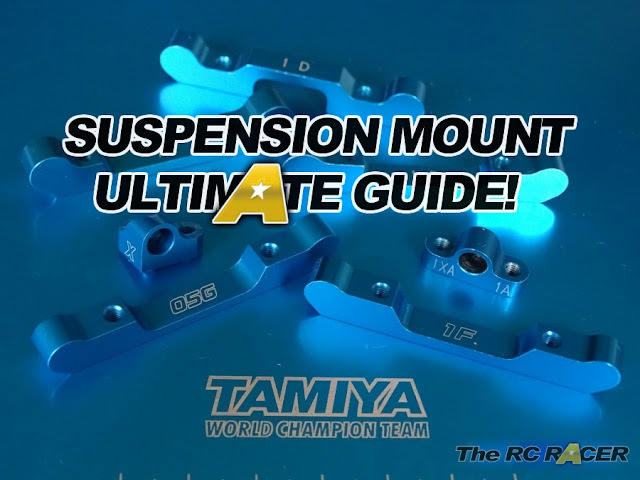 There is a rubber O-ring included, but I found that using one each of the Tamiya 53577 TRF Damper Red Urethane bushings in each end reduced the movement without any binding. These parts are cheap and if you are serious about making the car more race ready then it will provide you will a benefit, personally I think the weight reduction is a big advantage, and for the price it does provide a nice easy to fit upgrade.